73% Merlot, 18% Cabernet Sauvignon, 9% Petit Verdot. Merlot-driven on account of leaf-roll virus evident in some of the Cabernet Sauvignon plantings. Black fruit, graphite, some leafiness and the start of some developed character. Medium bodied with fresh acidity and fine tannins. A stylistic outlier in the line-up remarkably successful given the dominance of Merlot. 69% Cabernet Sauvignon, 14% Merlot, 11% Petit Verdot, 6% Cabernet Franc. Black fruit, a hint of mint, chocolate and a slightly dank note. Rich and chunky, the finish savoury. 75% Cabernet Sauvignon, 15% Merlot, 10% Petit Verdot. Black fruit, some leafiness and tilled earth. Lovely fruit purity, fresh acidity and firm but fine tannins – great composure and good for many more years. 82% Cabernet Sauvignon, 10% Petit Verdot, 8% Merlot. 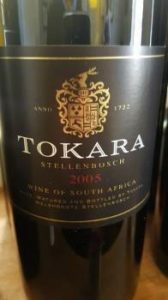 Particularly fragrant with notes of red and black fruit plus some fynbos. Succulent on entry but a little bit loose in terms of structure and hot on the finish. 67% Cabernet Sauvignon, 20% Petit Verdot, 8% Merlot, 5% Malbec. Red, black and blue fruit plus a hint of fynbos – still remarkably primary. Good fruit expression, fresh acidity and properly ripe tannins – the product of a cool vintage facilitating late picking. 73% Cabernet Sauvignon, 15% Petit Verdot, 6% Merlot, 4% Malbec, 2% Cabernet Franc. Red and black fruit plus some floral perfume. Relatively medium bodied with fresh acidity and fine tannins. Plenty fo charm. 78% Cabernet Sauvignon, 12% Petit Verdot, 5% Merlot, 5% Malbec. Red and black fruit, tea leaf and oak spice. A blockbuster – dense fruit and firm tannins. Intensely flavoured but hard work to drink. 68% Cabernet Sauvignon, 14% Petit Verdot, 10% Merlot, 5% Cabernet Franc, 3% Malbec. Red and black fruit, some leafiness and graphite. Super-concentrated but not unduly weighty. Has a freshness about it and finishes long and dry – very impressive. 72% Cabernet Sauvignon, 15% Merlot, 10% Petit Verdot, 3% Cabernet Franc. Quite heady on the nose with plenty of ripe berry fruit. Appears relatively sweet and smooth textured on the palate. 67% Cabernet Sauvignon, 16% Merlot, 7% Petit Verdot, 5% Malbec, 5% Cabernet Franc. Extraordinarily primary in the context of the line-up. Pure fruit, fresh acidity and lovely ripe tannins. Should age particularly well.